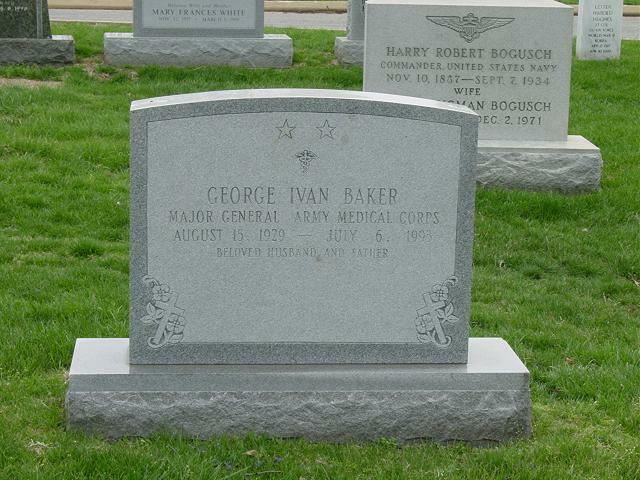 George I. Baker, 65, an orthopedic surgeon and former commander ofthe Walter Reed Army Medical Center, died of cardiac arrest July 6, 1993. He was in private practice in Syracuse, New York. A graduate of Syracuse University and the State University of New York, he came to Washinton, D.C. in 1954 to complete an internship at Walter Reed Hospital. He spent more than 17 years in the D.C. area, including overseeing the completion of the present medical center. He was promoted to Brigadier General in 1975 and 2 years later received his second star asa Major General. General Baker served in Germany and Vietnam and supported medical operations in the Congo, Lebanon, Greece, Norway, Peru and Colombia. His medals include the Distinguished Service Medal, the Legion of Merit, an Air Medal with Combat V and 5 Oak Leaf Clusters, and the Army Commendation Medal with Combat V and 2 Oak Leaf Custers. Was also awarded badges for combat medical, expert infantryman and flight surgeon. He received the Order of Military Medical Merit and the A prefix as an orthopedic surgeon in 1971. After retiring from the Army in 1980, he continued his relationship with the Uniformed University of the Health Sciences, participating in teaching sessions and serving as a visiting professor to American military hospitals in Europe. He also served as a clinical associate professor at SUNY's Health Science Center and was on several committees at Community General Hospital, both in Syracuse. He was a member of Syracuse's St Stephen Lutheran Church, serving on its Congregational Council. He was also a member of the Council of the Upstate New York Synod of the Evangelical Lutheran Church in America and was a member of the Board of Trustees of the Lutheran Theological Seminary in Philadelphia. He was also active in the Shriners, both in the US and in Germany. Survivors include his wife, Diane; a daughter, Anne Santee of Boca Raton, Fla.; and son, Robert Bjertness Baker of Atlanta. Funeral svces will be at 9 am Tue at Fort Myer's Memorial Chapel with burial in Arlington National Cemetery. A memorial service will be held at Walter Reed's Memorial Chapel at 3 pm Mon. Family suggests that expressions of sympathy be in the form of contributions to the Max J. Baker Scholarship Fund at the Maxwell School of Citizenship at Syracuse Univ, Syracuse, NY 13210.